Sleeping neck pain describes symptoms which occur while in bed and often prevent successfully resting to one degree or another. The potential causes of neck pain at night are virtually infinite and the treatment approaches used to battle these sources of torment are just as numerous. Depending on the nature of the pain and the patient’s diagnostic history, neck ache while asleep may be considered a nuisance or a major health issue, or anywhere in between, since every case is different and each patient will be affected to a personalized degree. A bit of tension and pain may not create significant worry or effect, while a patient with blinding pain, who can not sleep at all, may be in for some real trouble. 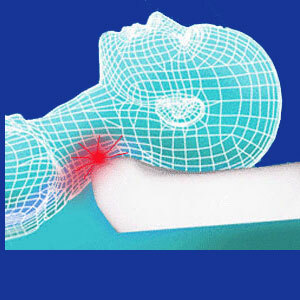 This informational article profiles neck pain which occurs when the patient attempts to sleep. Some patients might not be able to get to sleep due to their symptoms, while others might be woken up nightly by recurring discomfort. Pain which occurs in bed is most common. This may be immediate upon lying down, but is more commonly experienced after staying in a static position for a time. Pain is likely to wake patients during the night and may prevent sleep occasionally or regularly. A stiff neck is common after a long day of physical work or even from sitting at a desk. This may indicate muscular neck pain which may or may not be a concern. However, stiffness which worsens when lying down is usually structurally illogical, since relaxation should bring relief, not symptomatic escalation. Chronic muscular tension may be an indicator of a stress neck pain condition. An internal emotional tension is likely to be fueling the bodily symptoms. Therefore, until the psychological issues are assuaged, the symptoms will likely continue. Knowledge therapy may be the right fix for this type of pain in many sufferers. Remember, when sleeping, the subconscious is truly in control. Known neck injury, or a diagnosed degenerative condition, may be positional or movement sensitive and may enact pain when the patient sleeps in a particular way. Studying the nature of the symptoms may help provide some guidance on proper treatment. When you talk to your doctor, the more you can tell them about the specifics of the pain, the better they will be able to help you to find relief. Remember the old adage: Know your enemy. Postural and positional issues can often be solved easily through activity alteration and various forms of conservative therapy. Muscular pain due to overexertion and repetitive use will likely resolve on their own. Psychosomatic neck pain will probably become chronic and will not likely respond to medical care, since the root source of symptoms is not addressed by any anatomical treatment. For these types of syndromes, only a psychological therapy will be likely to provide long-term benefits, while the placebo effect of traditional treatments will probably lead to substitute symptoms elsewhere, at best, or an escalation of pain at worst. Most patients with sleeping neck pain immediately think they need a new pillow or mattress. Of course; We are well-conditioned consumers. Spend that money. Will it bring relief? Well, maybe, but maybe not. The answer may be easier or more complicated than that. As always, we advise learning all you can about the suspected source of your pain and becoming ever-more active in your own healthcare plan. If you don’t and your pain continues, then you really have no one to blame but yourself. Do not look for a miracle cure for nighttime pain, since it is unlikely to exist and will probably turn out to be a huge waste of money. 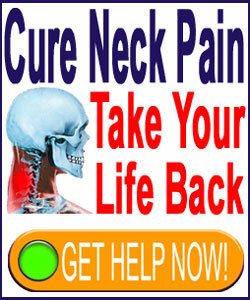 Nighttime neck ache is a problem that has plagued me over the past few years without resolution. I know that every disc in my neck is herniated, as are the first 4 in my thoracic spine. That being said, I generally have few serious symptomatic neck issues and know that tension and the nocebo effect play huge roles in my own symptoms. I find that simply taking the time to look inside and think about what is on my mind has provided greater benefits than all the physical treatments I have ever tried. Combine that with a loving massage from my wife and I think I can sleep through the worst of it, at least most nights.